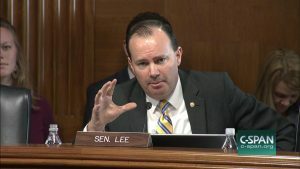 According to Senator Mike Lee, It's Time to Abolish Law Enforcement Authority of Federal Land Management Agencies | RANGEfire! As the primary election season in Utah heats up, a common fixture on the sides of Utah’s roads are the various signs from political campaigns. In each county you are likely to find several different signs from those running to serve as the county sheriff as they fight for name recognition. In addition to these signs, candidates will knock doors, hold meetings, and do what is necessary to earn the votes of their county. This kind of political accountability is a necessary ingredient for a law enforcement institution to earn and maintain the public trust it needs to do its job effectively. For years, those who live in the West have had to endure a growing law enforcement presence within the public land agencies that manage vast swaths of land in Western states. This growth in a federal law enforcement presence has come at the expense of local law enforcement agencies, like county sheriffs, who have seen their authority diminished within their jurisdictions. In addition to the loss of local control they facilitate, these federal law enforcement programs within public land agencies have become embarrassing examples of abusive power. These programs have become expensive to maintain. Worst of all, they have eroded public trust in federal land management agencies. As these programs are run by career bureaucrats, Americans have no recourse to remove bad actors from office. As problematic as these law enforcement programs are on the surface, leaked memos and recent court proceedings have revealed that these law enforcement agencies operate from a culture of corruption that has led to heavy-handed and unnecessary enforcement tactics by agents who act as if they are above the law. If it were necessary to have these law enforcement programs to ensure compliance with federal law, perhaps one could make the argument that they just need to be reformed. However, they serve no purpose that couldn’t already be fulfilled by local sheriff departments and the U.S. Marshals. Accordingly, I believe Congress should abolish the law enforcement programs within agencies like the Bureau of Land Management and the U.S. Forest Service and empower local law enforcement to meet the law enforcement needs of communities with abundant federal land. I will fight for this effort in Congress, but rural communities in the West will need to unite together if we are going to accomplish this. Let me know if you agree that we should abolish federal land agency law enforcement programs and empower local officials – like the County Sheriff – to enforce the law on public land. Senator Mike Lee is right. Sure we may still need these agencies but the Sheriff is and should be the highest law enforcement in the County. Time to push the Feds back where they belong and stop the undermining of local law enforcement. And with Millard County having the highest ratio of Sheriff’s deputies per capita in the entire western U.S., Millard County will not have to hire any more deputies to meet the demand. The Constitution of the U.S. is a brief document outlining the powers delegated to the Federal government, the state governments and those retained by the people. Only those with the power can delegate the power to another. In view of the fact that The U.S. Forest Service and the BLM do not fall within these delegated powers simply means that these organizations are illegal and unlawful. Furthermore, there is no delegated power to maintain illegal organizations with a police force. Encroachment suggests a gradual usurpation of powers which is the method historically used to get by a disinterred and apathetic people. In a detailed study of the land distribution in 1997 the author of this comment discovered from official government sources that less than 5% of the land in Millard County was available to private citizens for homes or businesses and these lands were heavily regulated. It is highly unlikely that the situation has improved in favor of the citizen. What do you think? Dr. DH: Your comment is right as rain. BLM & their ilk are Executive Branch overreach. The Sheriff is the Top-of-the-Line law enforcement person in the county & should remain so. The Federal Government was” enlarged” to PROTECT the States & their populace from FOREIGN ENCROACHMENT (Globalization-caused disappearance of the states’ economies). Senator Lee is correct. We deal with the BLM and Forest Service and both agencies have rules that they enforce as laws which have never been considered by Congress. They levy fines and enforce rules as if they were laws. We have tried to obey the rules and have always paid our fees but they still are dealing with us negatively. I want to join Senator Lee in this issue and see that others are treated more fair than we have been. What happens when you strip these federal agencies of their ability to protect public land. Most likely you allow private interest to come in and buy off the land and impede the ability of the public to use said land. You plan on destroying the North American model of conservation. Just know it will not be an easy fight and the people will do everything in their power to stop your agenda Mr. Lee.